YENAKIEVE, Ukraine -- On a recent spring morning, an important visitor watched Russian-backed rebels conduct infantry maneuvers on the sunlit training grounds outside this town in eastern Ukraine. 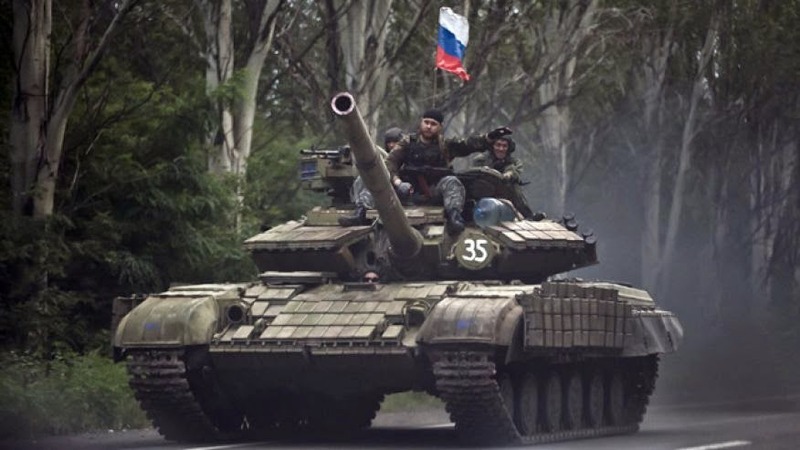 Pro-Russian rebels ride on a Russian tank flying Russia's flag on a road east of Donetsk, eastern Ukraine. The man -- almost certainly a Russian military officer -- became alarmed when he saw two journalists approach. His entourage shielded him from all sides, warning that photos were forbidden, and the group soon sped off in a four-car motorcade, with the "general" safely inside a black Toyota SUV with no license plates. They may wear camouflage, but the Russians' presence in eastern Ukraine is hardly invisible. More recently, as a shaky cease-fire has taken hold, Russia has kept fewer troops in Ukraine but has increased its training of rebels to make sure they are capable of operating sophisticated Russian weaponry and defending the territory they control. NATO and an independent London-based Russian scholar estimate that Russia has several hundred military trainers in eastern Ukraine. Since hostilities began around mid-April of last year, the Ukrainian government and the West have accused Moscow of waging an undeclared war in Ukraine by sending thousands of Russian troops to fight on the side of the separatists and providing the weapons to drive back the Ukrainian military. At least 6,000 people have been killed on both sides. Throughout the conflict and often a few days before a new flashpoint of fighting would erupt, AP reporters would see as many as 80 armored vehicles a day, mostly coming from the direction of the Russian border, carrying troops and towing artillery. Their ultimate origin was impossible to establish, and the rebels strongly discouraged reporters from photographing such convoys or following them. "Yes, our brothers are supplying us -- you know who," one fighter who goes by the nom de guerre Taicha said in November at a checkpoint in the crossroads town of Krasny Luch. Most rebels won't reveal their full names for fear of retaliation against their families. Months later, on the front line west of Donetsk, a sniper who goes by the name of Kvadrat, or "Square," showed off his new rifle from Russia. "Uncle Vovka is helping us," he said, using a nickname for Russian President Vladimir Putin. "Our friends helped us," Andrei, a fighter who fought in Debaltseve and is based outside Luhansk, said with a shy smile. Unlike his platoon, which had nothing newer than a T-72 tank, he said the Russians had modern T-90s. "They had everything, of course," said Andrei, who like other rebels would not give his last name because his family lives in an area controlled by Ukraine's government. "If they hadn't gone in (to Debaltseve), I don't know what we would have done." He was flippant about the Russian presence in Ilovaysk, saying "just a couple of tanks pushed through." "I'm not going to hide it: Russians were here. They went in and left quickly." He recalled how the rebels were often reluctant to attack, while he and his fellow Russian soldiers had no choice but to obey orders and advance. Batomunkuyev, a native of the Siberian city of Ulan-Ude near the Mongolian border, could not be reached by the AP. Sutyagin corroborated the rebel fighters' descriptions of Russian troops entering Ukraine and leaving promptly after a battle is won. By his calculations, several hundred Russian servicemen are still in Ukraine, training local troops and coordinating rebel forces. The Russian Defense Ministry did not respond to numerous calls and faxes seeking comment for this story. Putin's spokesman Dmitry Peskov said Tuesday that Russia "firmly denies" reports of a Russian military presence in Ukraine. NATO insists Russian troops continue to operate in eastern Ukraine despite the cease-fire, but it is unable to give exact figures. In recent months, according to Lt.-Col. Jay Janzen at NATO headquarters in Brussels, Russia has transferred more than 1,000 heavy weapons to the separatists, including tanks, armored vehicles, rocket systems, surface-to-air missiles and artillery. Gen. Philip Breedlove, commander of NATO forces in Europe, said the alliance's intelligence indicates that trainers from Russia's special forces have been instructing fighters in eastern Ukraine about sophisticated weaponry that the Russian military has supplied. Breedlove estimated 250-300 advisers are supervising the training. One evening in November, a rebel garrison on the outskirts of Donetsk was on the move. Fighters busied themselves hauling their belongings into the back of pristine military transport trucks. One middle-aged rebel fighter, who identified himself only by the nom de guerre Kesha, said he and his comrades were leaving for training. The instructors, Kesha let slip, were Russian nationals. Asked what his combat-hardened battalion still had to learn, Kesha said with a chuckle: "All kinds of things." "Why did you open fire? I didn't give you an order to open fire!" "He said you did fine. But I actually think it was not fine. There's still a lot of work to do." The hotel appeared largely empty, although potential guests were told there was no vacancy. Its restaurant was frequented almost exclusively by middle-aged men, some in camouflage with epaulets. They didn't say a word in the presence of strangers. Every corner of the hotel was guarded by armed men with the deportment of professional soldiers. Some slouched in chairs in the lobby for days, watching Russian TV. The glittering ammunition belts of their machine guns rested on the floor. One morning, a military truck arrived at the hotel with 12 men carrying large-caliber machine guns and sniper rifles. "One of the most important tasks now is to keep these republics as possible leverage on Ukraine," he said. "So they need to preserve these republics, make them combat-ready, and at the same time, make sure that the sanctions against Russia are lifted."